The market for hybrids is heating up as more popular nameplates are getting hybrid versions. The Honda Accord has been one of the most popular four-door sedans for decades, and with this hybrid version it will get plenty of attention in the marketplace. 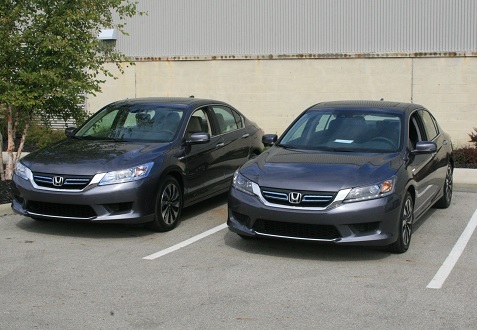 I drove the Accord Hybrid on a wide variety of roads and found the vehicle to be very responsive. In one of the city setting we were challenged to try to get the highest gas mileage along a prepared route. Once you get the hang of how the Hybrid works you can achieve some very impressive mileage numbers in slow traffic areas. The 2014 Honda Accord Hybrid is EPA rated at 50 mpg in the city and 45 mpg on the highway. More importantly, the combined rating is 47 mpg, and Honda’s new two-motor hybrid system (introduced last year with the Accord Plug-In Hybrid) aims to deliver those numbers to all but the incurably lead-footed. So, let’s start there, with the powertrain. It’s a complicated mess to understand if you’re not a Honda engineer (and maybe even then), but it’s a complicated mess that works well. You can also choose the plug-in hybrid model as well with the Accord, so we definitely have a new entry that will give consumers even more choices in this market. It’s clear you no longer have to sacrifice styling and comfort if you’re looking to be green or just save on gas costs. Will we see natural gas cars?